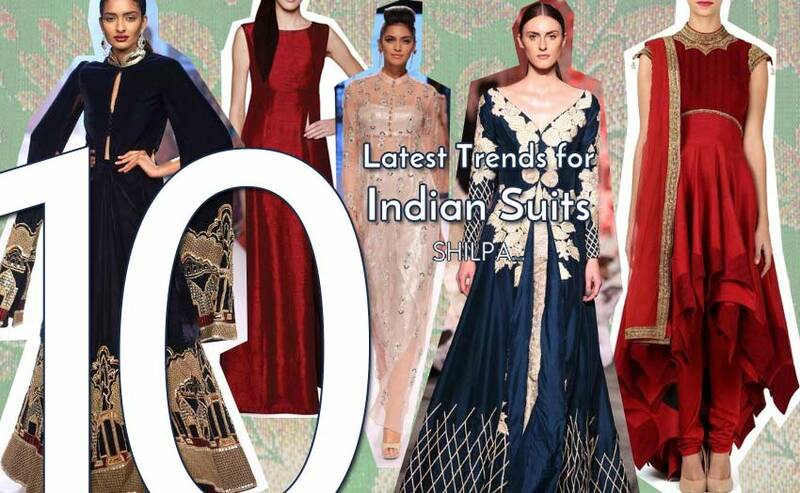 10 Latest Indian Suits You’ll Actually Want to Wear! 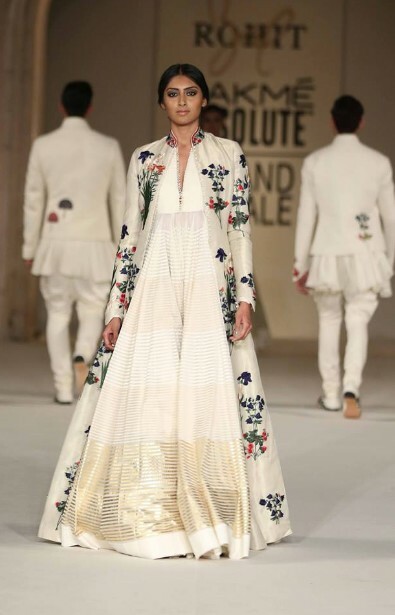 From indo-western to anarkali, from Rohit Bal to Manish Malhotra, here are the top 10 Indian suit and salwaar kameez trends for 2016, off the runways! Hey trend lovers! 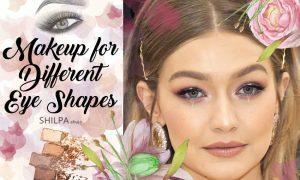 The latest fashion trends are something we all want to be updated on at all times. 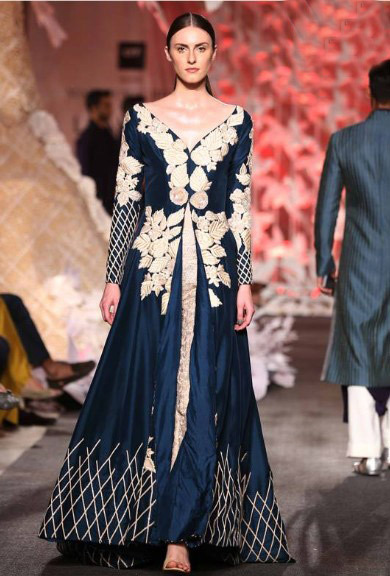 The Indian fashion weeks like LFW and AIFW happened a while ago, but today I am writing about Indian suits and salwaar kameez. Whether it’s your BFF’s wedding or your big day meeting your in-laws, salwaar kameez, chooridar and Indo-western suits are a great idea. 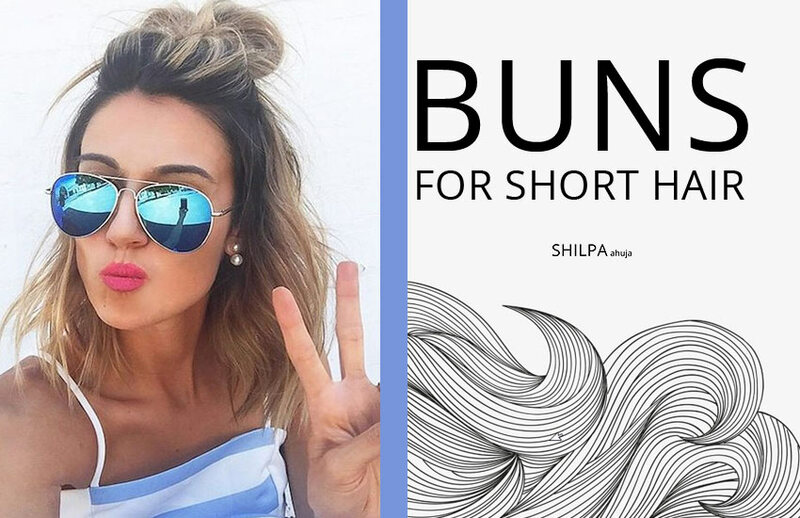 They don’t have to be boring, they can be fun, trendy and free-spirited! 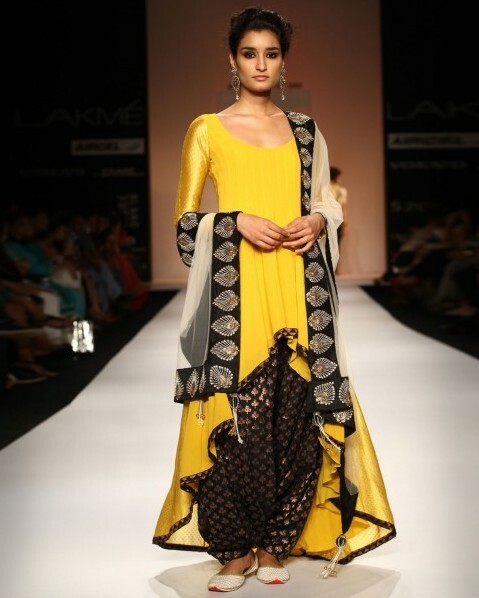 So let’s discover what the hottest trends are in the these Indian and Indo-western outfits. 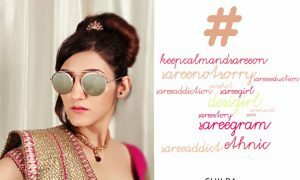 I looked through all the collections from Lakme Fashion Week 2016, and latest designer collections in the stores, to pick out the top 10 Indian suit trends to inspire you! 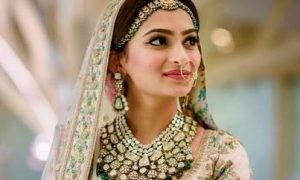 In suits and salwaar kameez, the lines are getting blurry between modern Indian, Indo-western and completely western dresses. 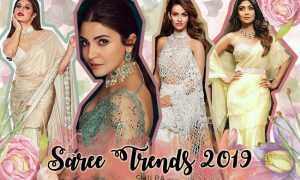 The fresh trends we are loving the most include high-slit tops, off shoulder kameez, crop tops and many more. 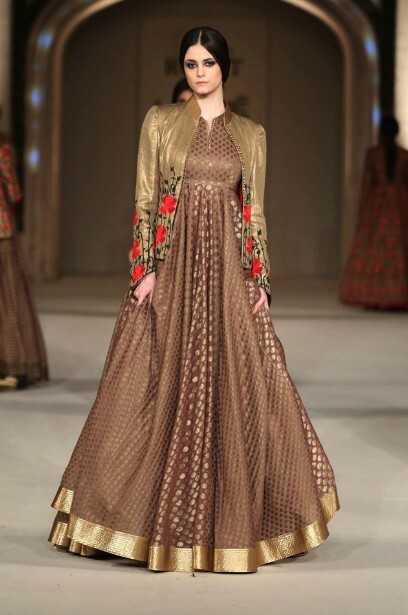 Plus we are seeing some trends from the previous seasons, like floor length anarkali. Indo-western suits are the top trend in chooridars and salwaar kameez. This trend combines western details like asymmetry, sheer, crop-tops with traditional elements. Here are a few Indo-western outfits. 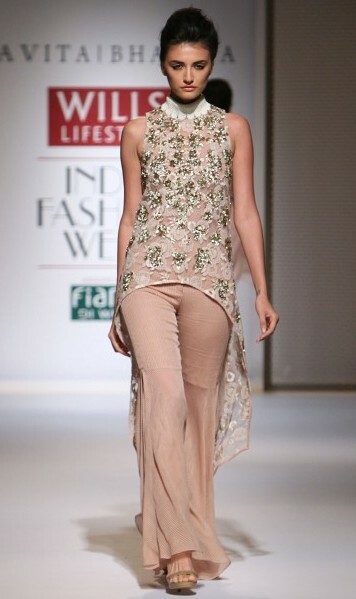 One has sequin sheer top paired with dhothi pants. 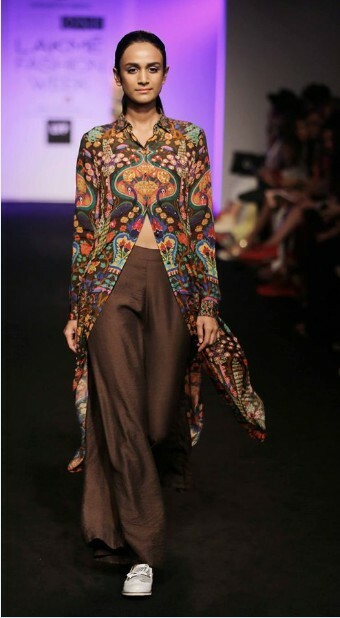 And I am loving the asymmetric top paired with palazzo pants which is really chic. The asymmetric hem is one of the most flattering silhouettes in trend these days. The kurta or top is shorter in the front and longer at the back. 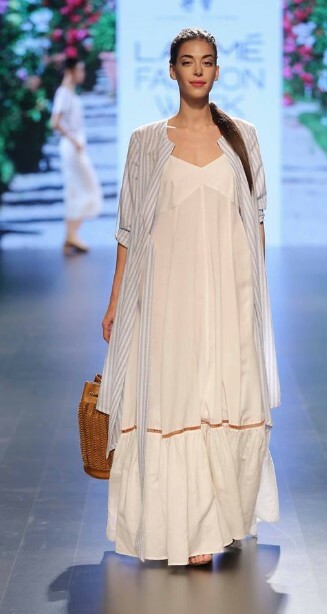 Asymmetric tops or kurtas can be paired with loose pants or aladdin style pants with a dupatta around. 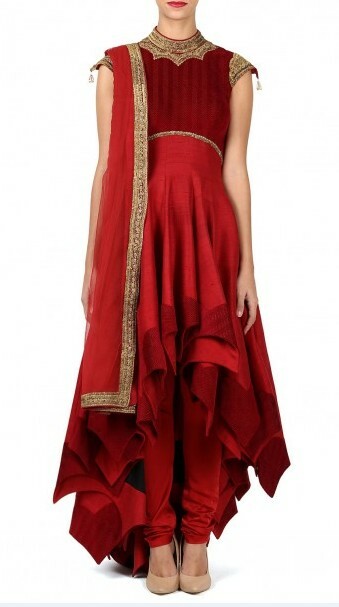 I am in love with the high neck collared red dress designed by Shantanu & Nikhil. Side slits are a great idea if you want a traditional look with a fresh twist. Side slit tops are a really new trend, which we are hoping will catch up more in the coming season. Pair them with a pair of silk embroidered pants for the perfect classy look. If you want to make a real statement, off-shoulder tops are the perfect idea. Loose off shoulder full or three-quartered sleeve tops paired with palazzo and loose Aladdin-style pants are really in. These may also be asymmetric. This would be a great option for party-goers. Front slit tops or dresses are surely an eye-catching fashion item. I love the concept. For an even sexier look, take the slit higher up to your ribs, and pair it with silk pants and palazzo. 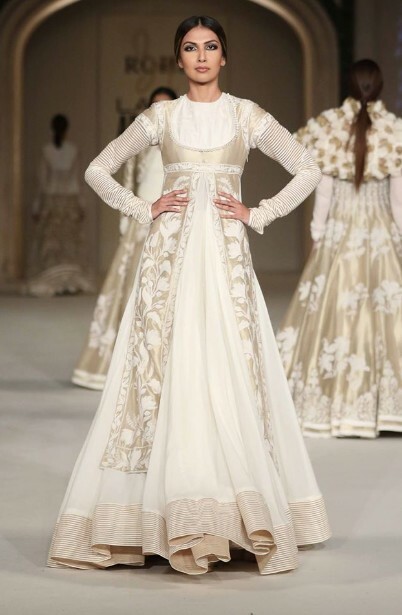 I am loving the concoction of royal anarkali dress paired with long flared jacket and embroidery. 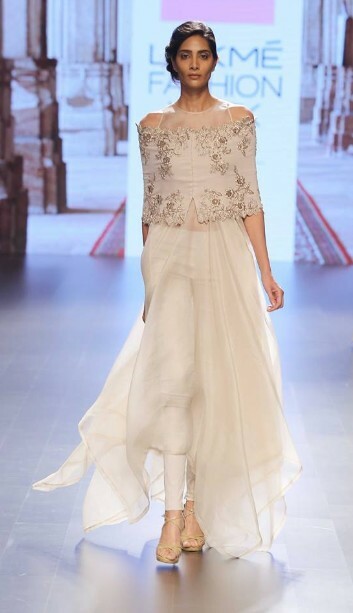 All of my favorites in this trend this year are designed by Rohit Bal. This amazing outfit is great for weddings and parties. Pre-draped duppattas are a great option for anyone wanting a fuss-free yet trendy outfit. It’ll also make a excellent addition to your party closet or trousseau. 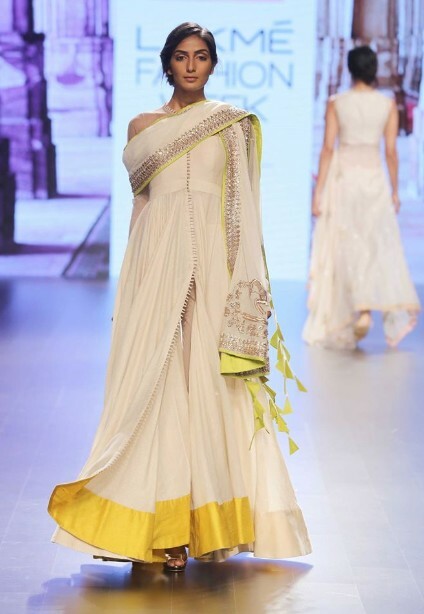 The designer that got me hooked onto pre-draped is Shantanu & Nikhil. These designer suits look really trendy, so you can get lots of pics for your Insta, just post ’em with some cool suit quotes for Instagram! 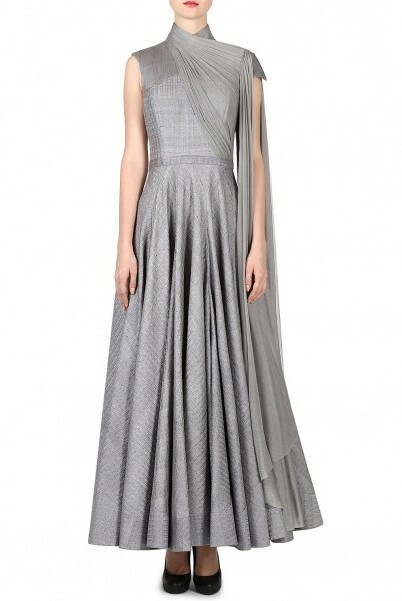 These graceful dresses give a magnificent and royal appeal. 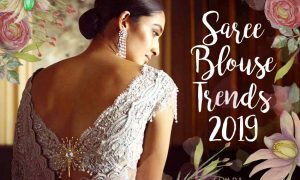 This trend has been in for quite a few seasons now, but it’s still one of the most favored choices for wedding and party wear. 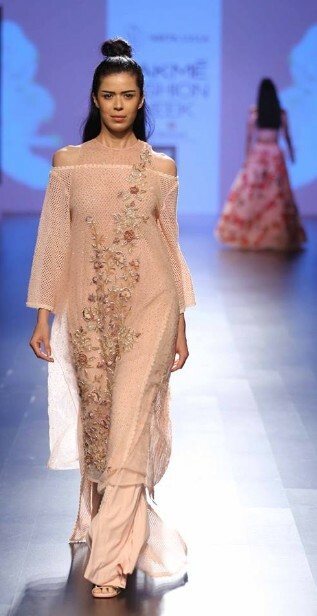 And I’m really adoring the peach-colored anarkali dress designed by Shantanu & Nikhil. Floor length suits with high neck and collar add a formal touch to the dressing. 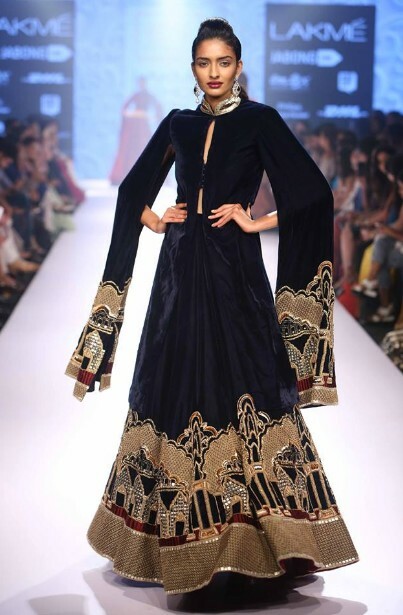 My favorite in this list is the navy blue floor length with the long kaftan sleeve by Neeta Lulla. Palazzo pants are back in fashion this season. 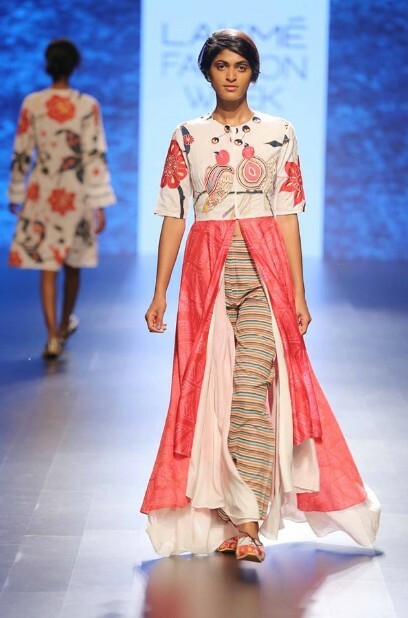 They’re a great idea if you’re bored of pairing your kurtis or tops with chooridar and salwars! Pair them with palazzo (or loose pants) as we move on from slim-fit to wider leg silhouettes. 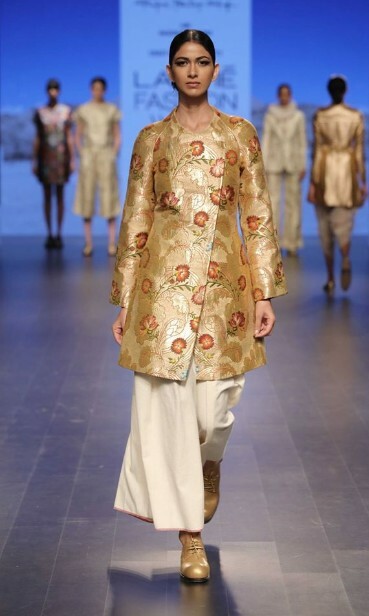 Here, I’m liking the floral print silk kurti paired with palazzo. So which Indian suit trend is your favorite this season? Comment below! I’m gonna write about Indo-western suits in more detail very soon! So, stay tuned. 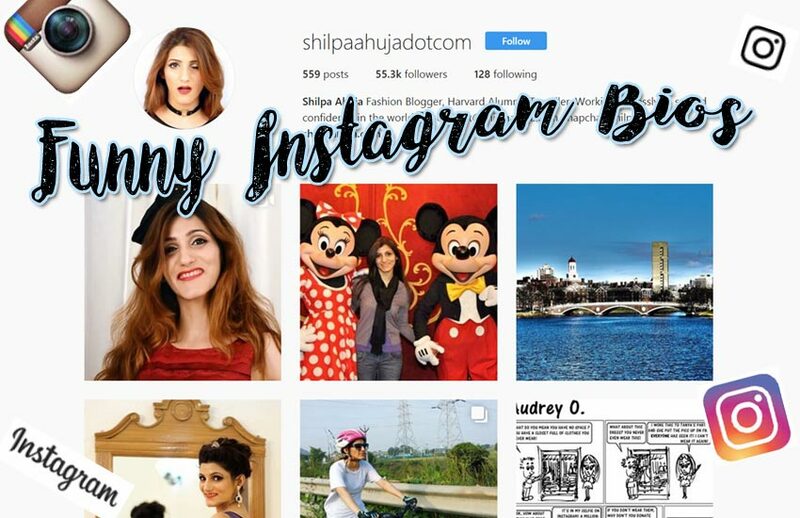 That’s a great post on Indian suits. 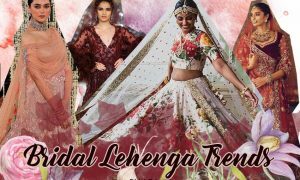 I love floor length anarkalis, suits with front & center slit and of course, the fusion of western styles with Indian – cape style anarkalis, off shoulder, sequins, sheer material… LOVE all of it. Give me a plain kurta and I’ll just wear it with jeans until it gets wrinkled and then I’ll never iron it again! So high maintenance!